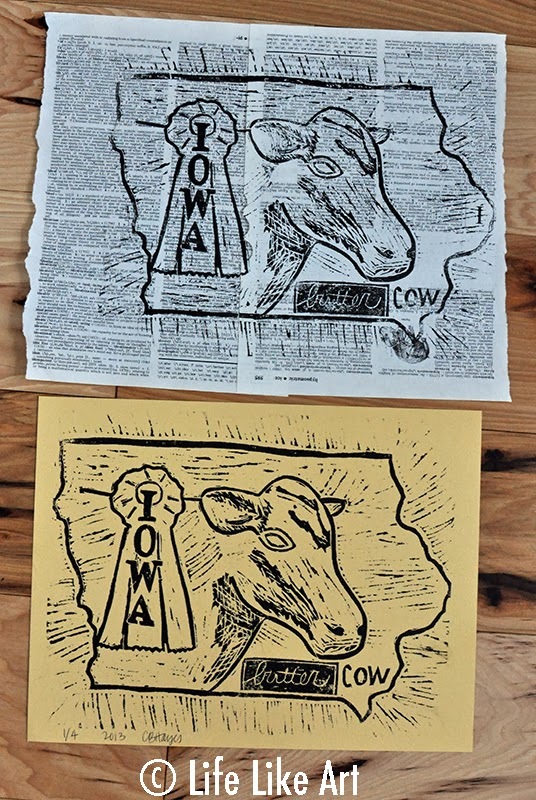 I recently finished another state themed block print – this time in homage to our current state of Iowa. We don’t have a catch phrase like y’all to work with, so I went with something the state fair theme. I know that plenty of states have state fairs, but I promise you, they have NOTHING on the Iowa State Fair. This is the Artist’s Proof run. I always make sure I do one of these when I think I am nearing completion of a print. This way, I can catch any mistakes or make any last minute changes. I noticed this time around that I did not cross my t’s on butter. I also decided to cut away more of the background in the state of Iowa. Prints and artwork are always for sale, please inquire by e-mail or through my Etsy shop, which is currently empty. If you are interested in purchasing something you have seen on this blog, I will create a custom listing for you. 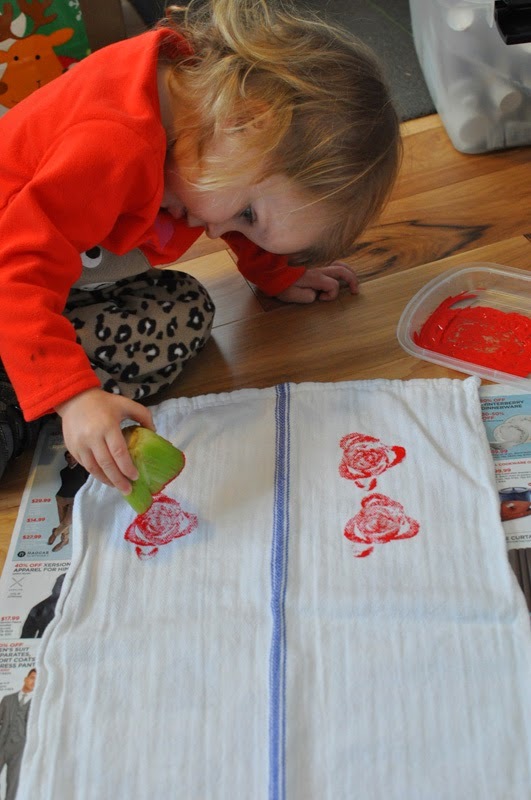 One recent sunny Saturday morning before Christmas, Greta helped me make these stamped towels. 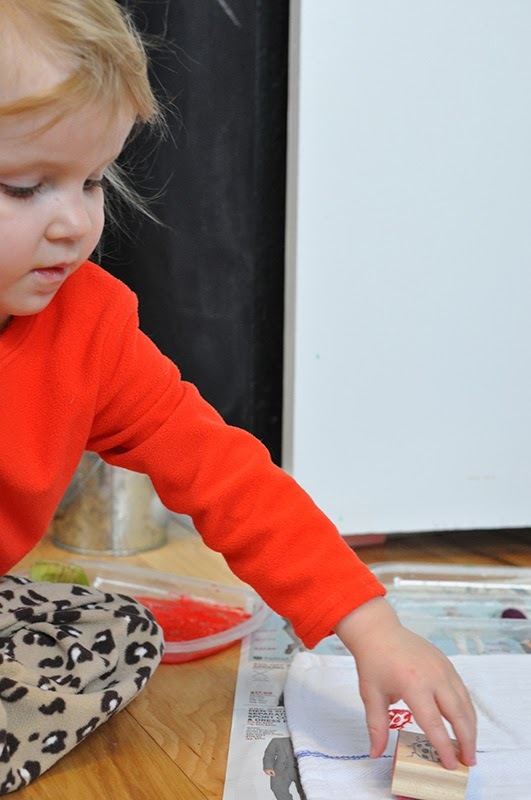 With minimal prep and basic supply list, they are an easy morning or afternoon project for all ages. I started with a set of white dish towels I ordered off of Amazon and washed and dried them. If they are wrinkly, it is a good idea to iron them as well. Next, I mixed up some regular acrylic paint with a bit of water. 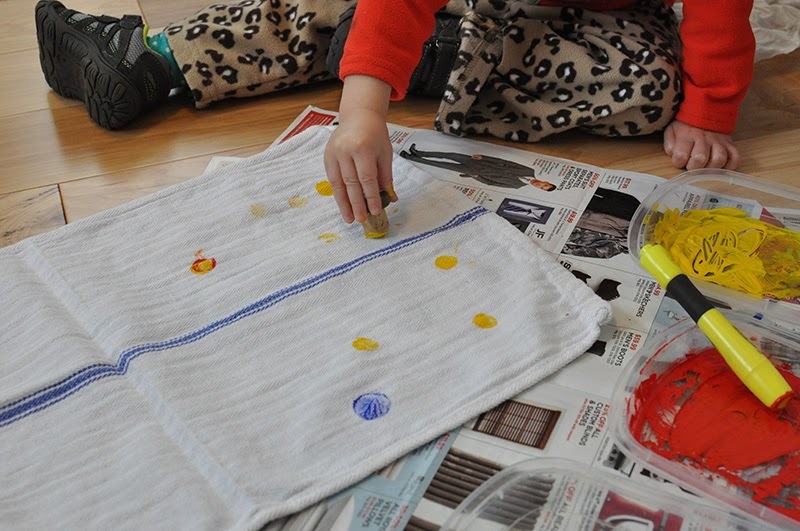 I wanted to ensure that the paint would soak into the fabric, but not be so watery that it would not produce a clear stamp. Always test the stamp before using. 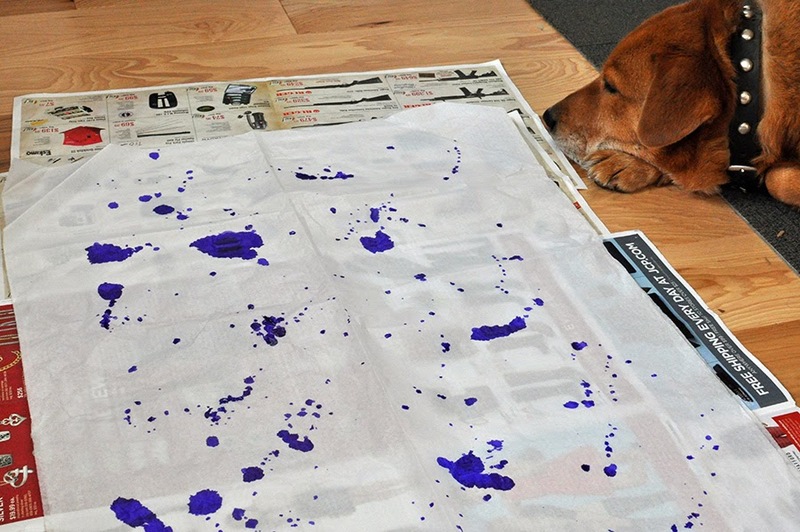 If the stamp has too much paint on it, your image will be blobby – so blot on newspaper or a paper towel. Takeout containers from our favorite Thai restaurant are the best palettes. I use them in my classroom to save paint palettes and keep supplies organized. A paper or plastic plate works well for a palette too. Next, I prepared my stamps. We use every day items as stamps as well as rubber stamps. This is the bottom of a stalk of celery – it makes a lovely floral design. It is also the perfect size for small hands to hold and stamp. We use several every day item stamps to create the polka dots – a cork with a handle, the base of a highlighter, and an eraser. 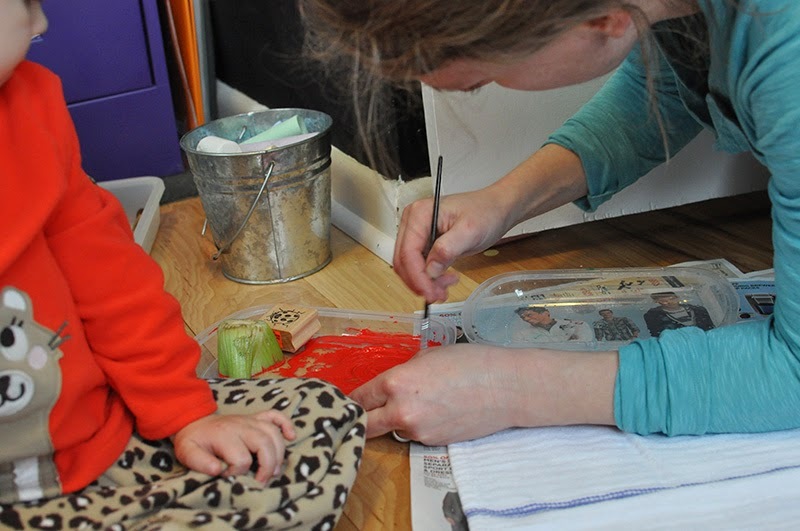 Of course we also broke out the rubber stamps too – there are just too many cute ideas with rubber stamps. This project was a success – Greta was patient and enjoyed the entire process. 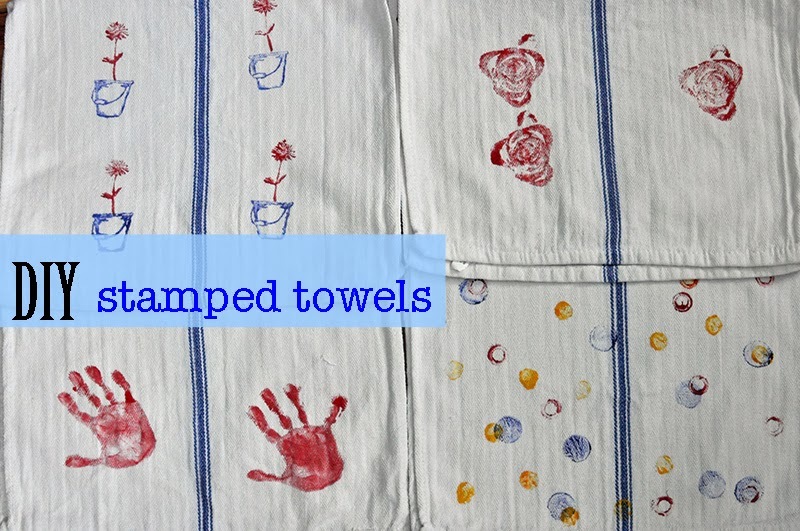 Her absolute favorite part was creating the hand prints on the towels – I had to watch her though, she wanted to wipe her hands clean on the towels we were stamping! 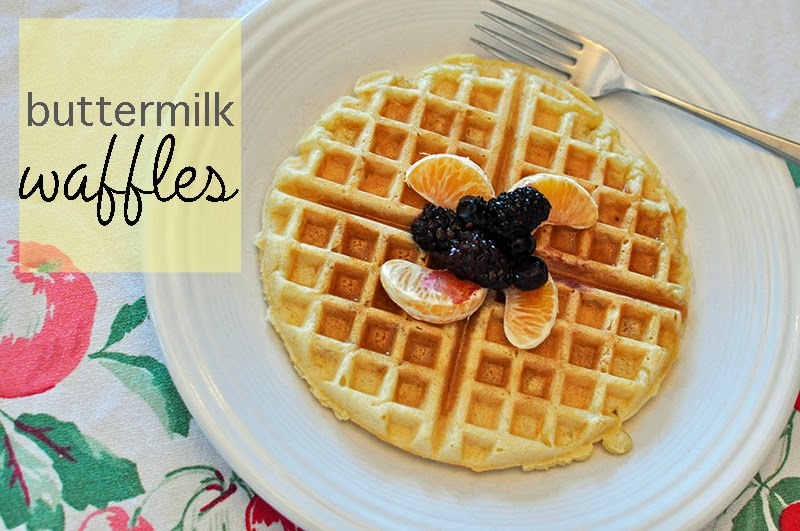 These waffles are my go-to waffle recipe for many reasons – they are better than store bought by far, they are light and fluffy, and they can be dressed up in a variety of ways. In years past, before being a mom, I made them for Christmas morning breakfast a few times. Now we save these waffles for weekends with family or friends. If there are ever any leftovers I freeze them for weekday mornings. The secret to these waffles is in the eggs. The eggs are separated during the mixing stages – the yolks are mixed in with liquid ingredients. The whites, however, are beaten until stiff, but not dry and then folded into the batter just before cooking. This makes them light and fluffy beyond belief. No one can resist just one of these waffles! I like to serve them with fresh fruit and maple syrup or Nutella. I use almost a 1/2 cup of batter in my waffle iron. I keep mine set on the lower side to prevent waffles that come out too brown. This is also helpful if you are planning on freezing and toasting them later – lighter waffles will not toast as dark. 1. Sift: 2 cups all-purpose flour, 1/4 teaspoon baking soda, 1-1/2 teaspoons baking powder, 1 tablespoon sugar, 1/2 teaspoon salt. 2. Beat in a separate bowl until light: 2 egg yolks. Add and beat 1-3/4 cup buttermilk (or buttermilk replacement), 6 tablespoons melted butter or margarine. 3. Combine the liquid and dry ingredients with a few swift strokes. Allow to sit while preparing egg whites. Beat until stiff peaks form, but not dry: 2 egg whites. Fold egg whites into batter. 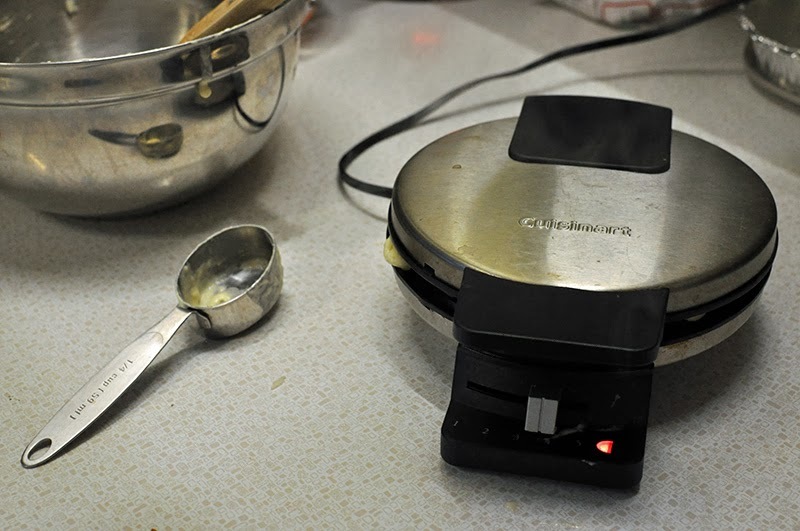 Cook according to waffle iron and preferences. Every year at Christmas, I write down the gifts I receive in hopes of staying organized when it is time to write thank you cards. I inevitably lose my list at least a couple times. 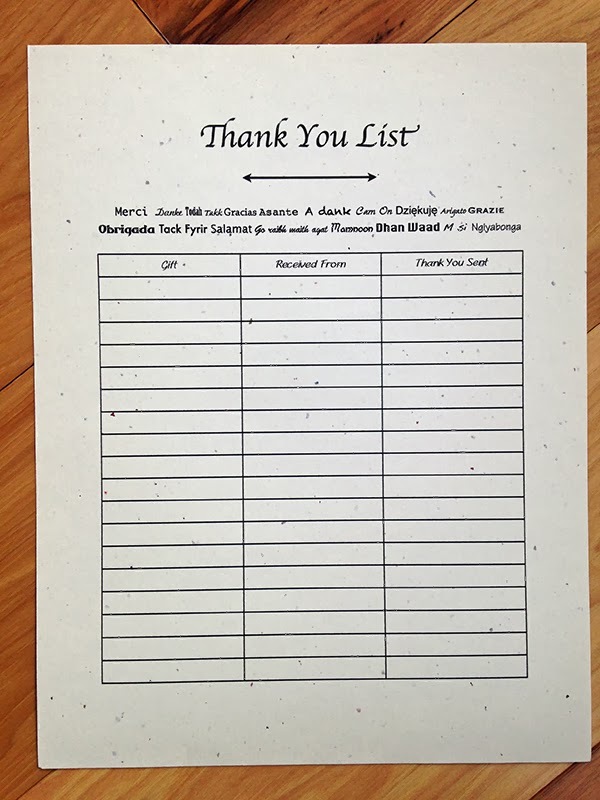 This year, I am trying a new approach with a list printed on nice card stock. I plan on making a few copies to disperse to family members who wish to use them as well. Here’s to a more organized me! I recently made these cookies for the holidays – the nice thing is I was able to share them with three sets of gluten-free people. Having friends, family, and colleagues who are gluten-free means experimenting with different recipes and ingredients frequently. For this recipe, I used the Bob’s Red Mill all purpose baking flour. It’s made with garbanzo bean flour, potato starch, tapioca flour, whole grain sweet white sorghum flour, and fava bean flour. The suggestion on the bag of flour said to use xantham gum as a binding agent, however, with the use of eggs and peanut butter, it wasn’t necessary. 1. 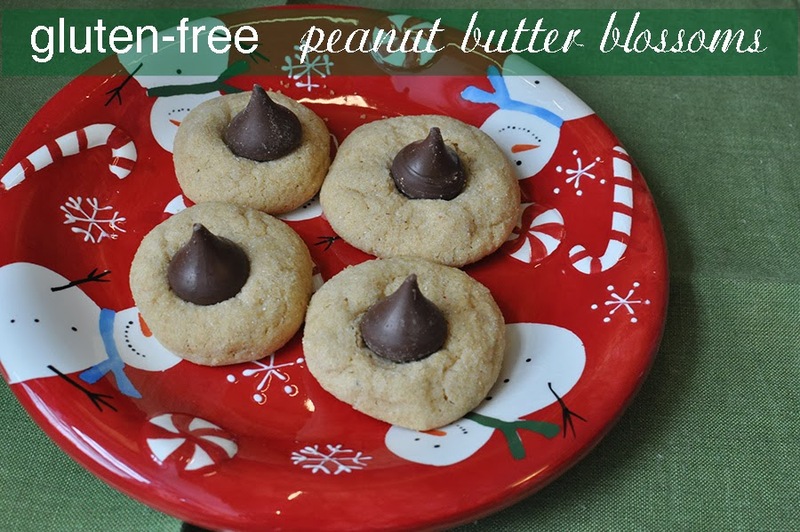 In a large mixing bowl beat: 1/2 cup butter or margarine and 1/2 cup peanut butter on low for 30 seconds. Add the 1/2 cup granulated sugar, 1/2 cup packed brown sugar, 1 teaspoon baking powder, and 1/8 teaspoon baking soda. Beat until combined, scraping sides of bowl. Beat in 1 egg, 2 tablespoons milk or milk alternative, and 1 teaspoon vanilla until combined. Beat in as much of 1-3/4 cup gluten-free all purpose flour* as you can. Any remaining flour stir in with wooden spoon. 2. Shape dough into 1-inch balls. Roll balls in the 1/4 cup granulated sugar. Place balls 2 inches apart on an ungreased cookie sheet. 3. Bake in a 350 degree oven for 10 to 12 minutes or until edges are form and bottoms are lightly browned. 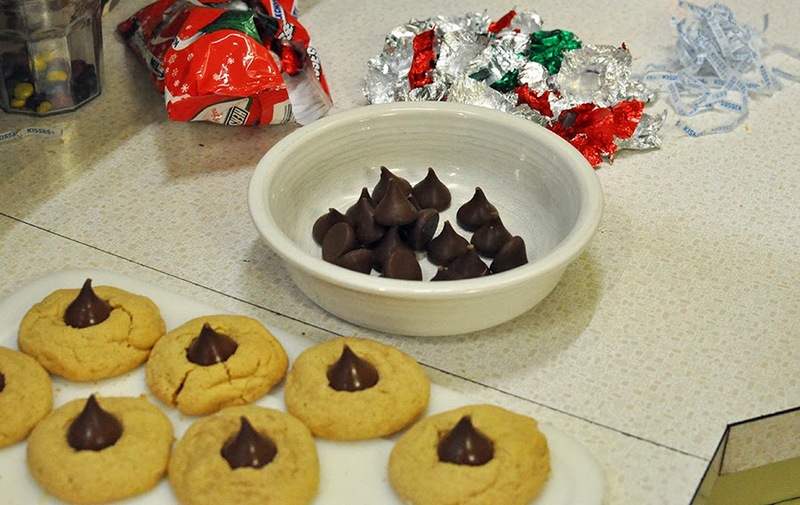 Immediately press a chocolate star or kiss into the center of each cookie. Transfer cookies to a wire rack and let cool. 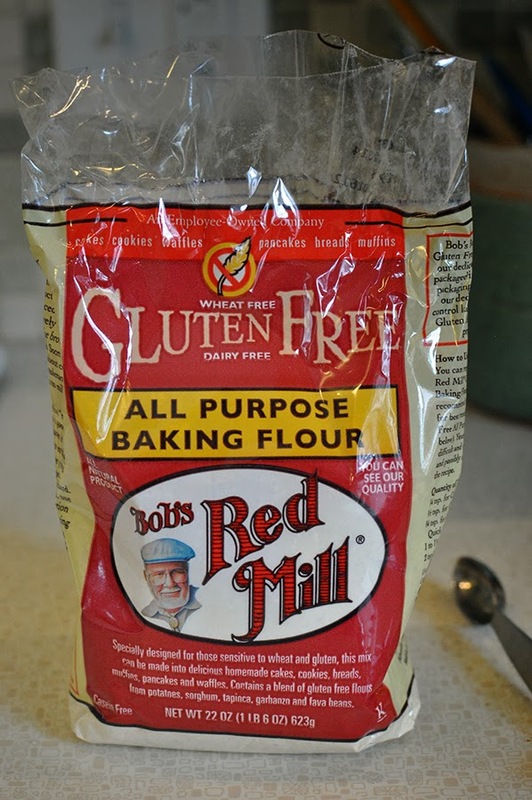 * Note: if you want to make this recipe without gluten-free flour, simply substitute regular all-purpose flour for the gluten-free flour. A friend of mine gave me a package of lovely origami paper this summer and it’s taken me this long to do something with it. We finally managed to get Christmas out of the boxes and up around the house this week. Now that we are in a new house, I have to reconfigure all my decor for the holidays. It’s nice to have a little more room to spread out the cheer. 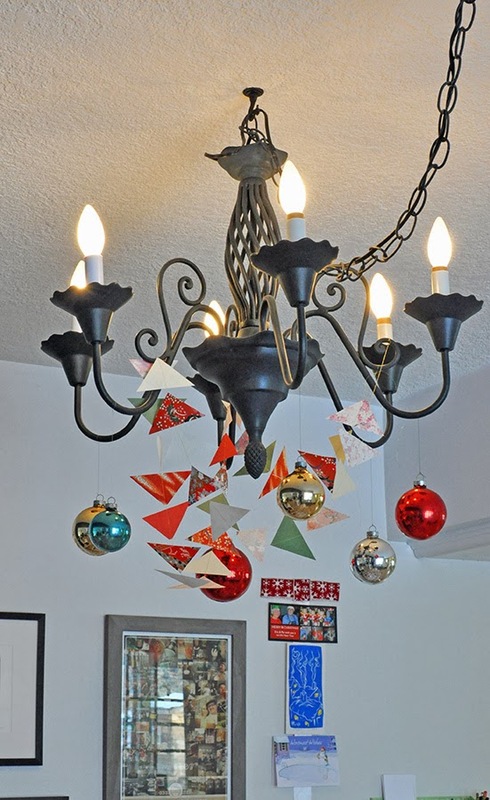 The cheer moved into the dining room this year in the form of glass ornaments and a simple DIY paper garland made from origami paper. 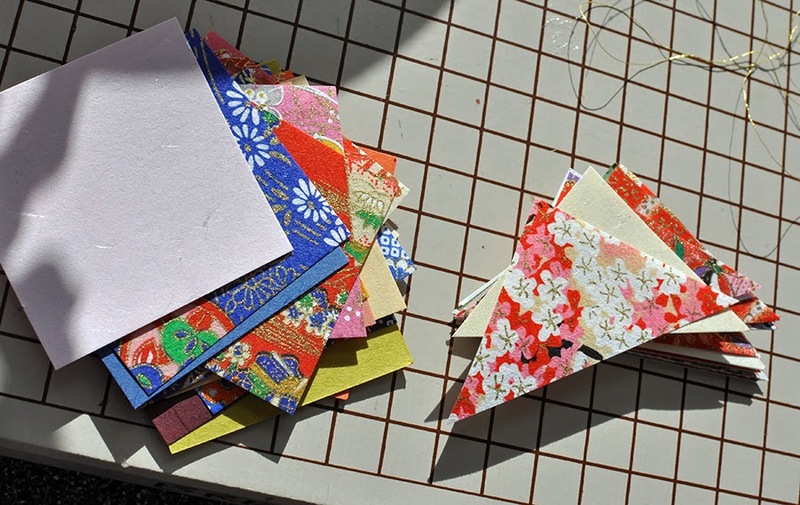 I started with the square origami paper and then cut them in half, using my paper cutter. One could also fold them if you wanted your garland to be two-sided. I stacked them up according to the in order in which I wanted them to appear on the garland. 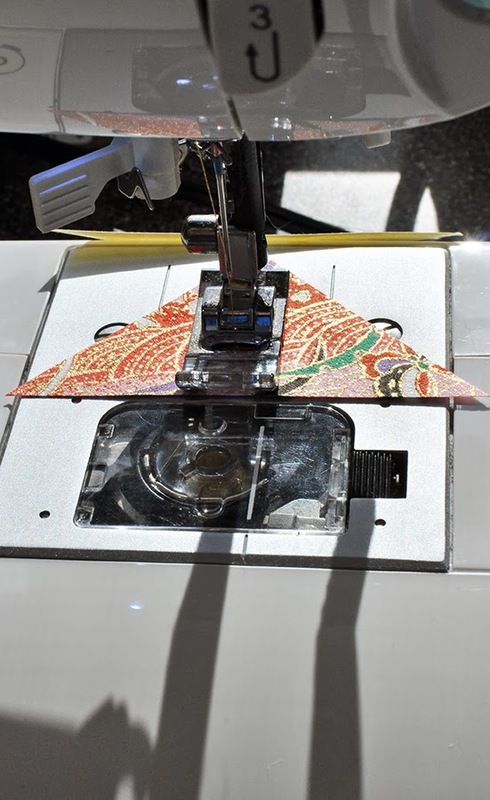 Then, I ran them through the sewing machine using a simple straight stitch through the middle of the triangle. I used festive gold thread to complement the gold theme throughout the origami paper. 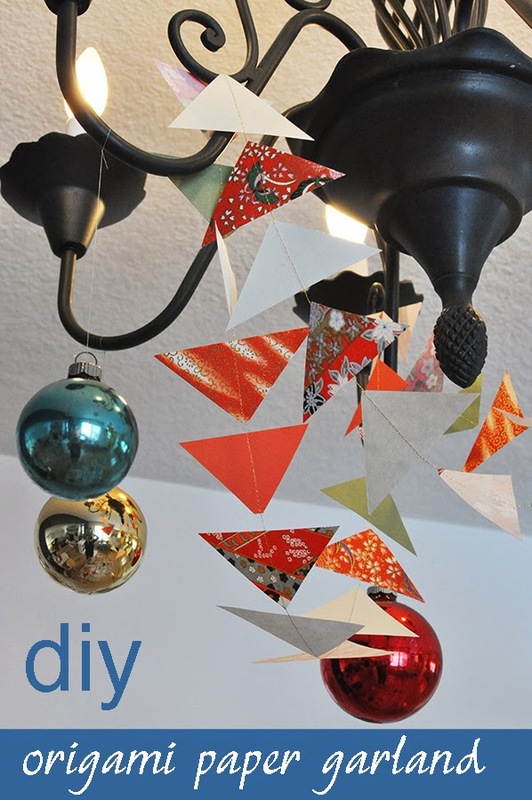 Be sure to leave a little space between each piece of paper to allow for movement and hanging abilities of the garland. The finished design looks festive, though I am thinking that this garland plus the ornaments may be a bit much. Like I said, I am still figuring out how things work in this new place – perhaps the garland will find a new home today. Sometime in the next few months that chandelier will get a makeover. I have bright plans for it. 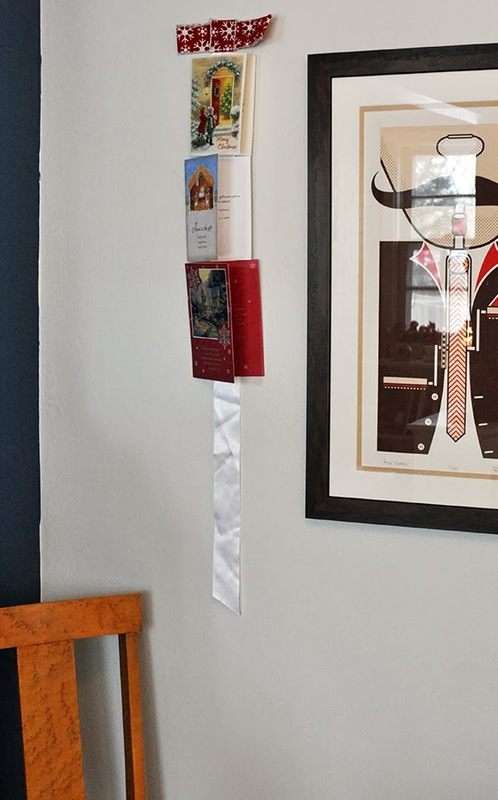 For years I have been using this ribbon to display my holiday cards – I always keep it in the dining room of our home so that the cards can be enjoyed throughout the season. It is fun to watch the photos and images of the holidays fill up the ribbon. This is the year I will have to expand to a couple more ribbons, they were overflowing last year! This was an easy project to make. I simply took a large white satin ribbon (it happens to be the sash from my wedding dress) and attached a red and white snowflake bow to the top. I created the bow with wire-lined ribbon that I hot glued together out of two loops. Then, I simply tape the cards onto the ribbon to display. Each year I roll up the ribbon and store it away, hence the lovely wrinkles seen in the first photo. 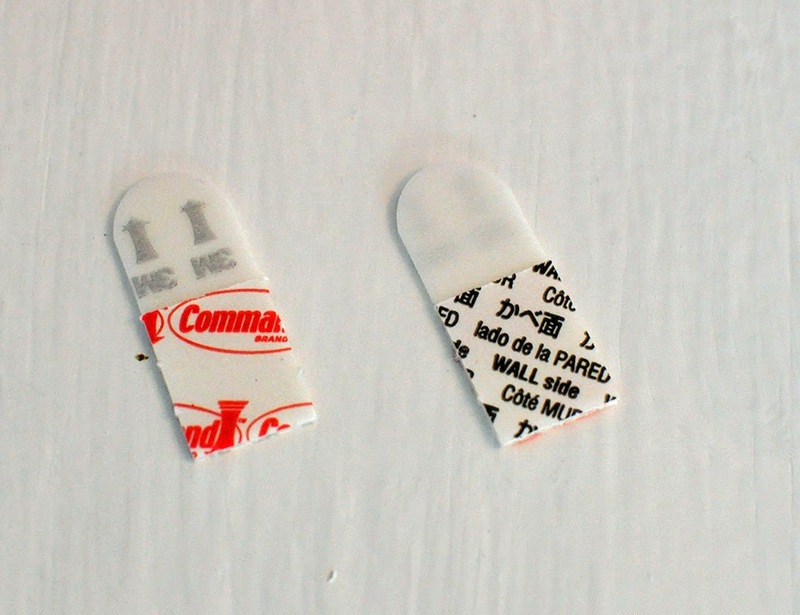 To attach them to the wall, I use these handy 3M sticky tabs. They make it easier to remove the ribbons at the end of the season and prevent paint removal. Happy decorating! This holiday season I have been making a point to create and use alternatives to wrapping paper. When we moved to Iowa, I gave away much of the wrapping paper, deciding it was one thing that did not need to make the 1,000 mile journey. I bought a roll for the kids’ paper, but for adults I have opted to make my own unique paper. This first paper was made by attaching a small section of bubble wrap to a small cardboard box. 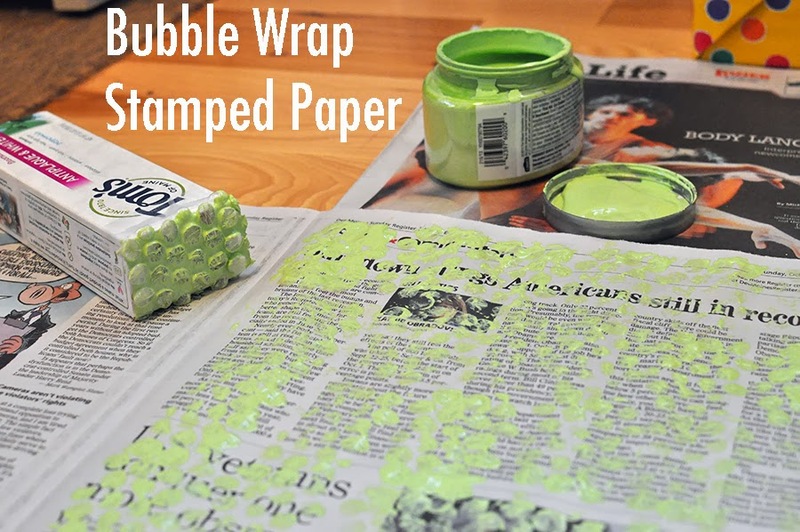 The bubble wrap stamp was then dipped in green paint and stamped on a large section of newspaper. My paint was a little on the thin side, so the stamped designs could have been clearer had I opted for a thicker paint. 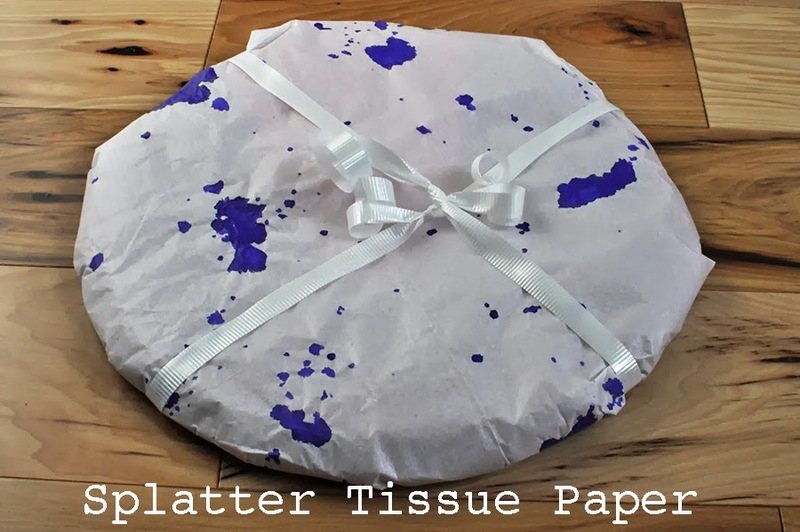 The next alternative to wrapping paper uses everyday tissue paper. I laid it out on glossy newspaper ads for protection of the surface underneath and then splattered with drawing ink. 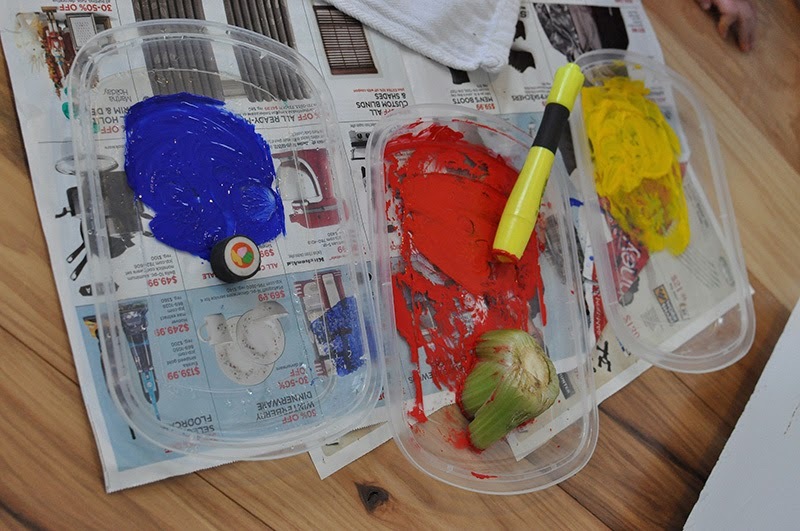 You could also use water color paints, which is also less permanent if you miss. The finished wrapped present has a few splashes of color – I like the deep blue for a cool wintry look. 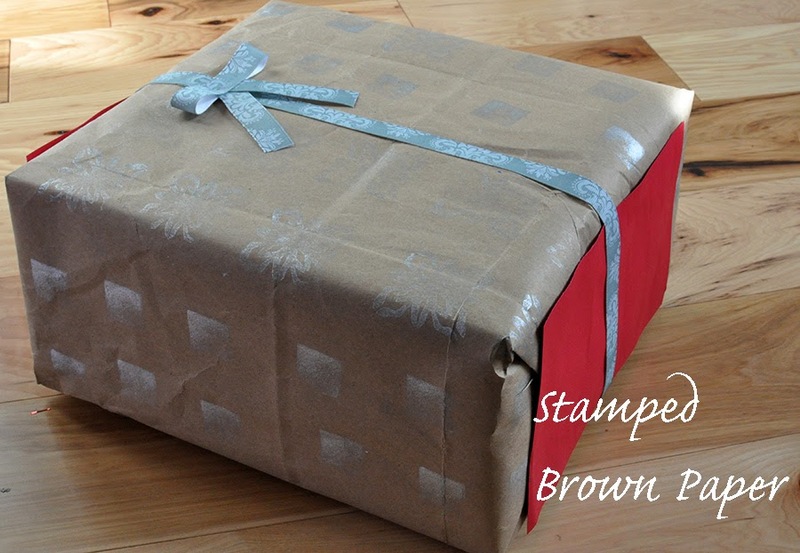 I got out the brown paper bags and cut them up for the stamped wrapping paper. The snowflake designs are a rubber stamp from a craft store and the squares are the actual silver stamp pad itself. I added red ends to the package to cover my sloppy tape job and to add a pop of festive red color. 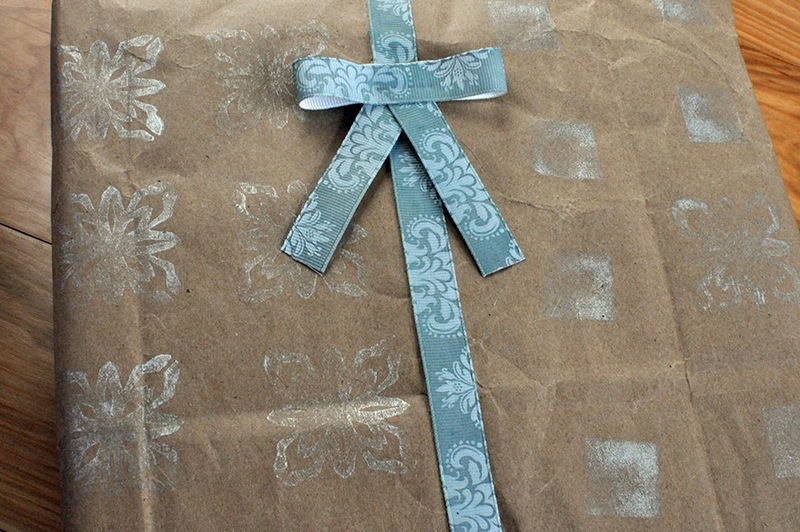 The blue-gray printed fabric ribbon adds even more class to a simple brown paper package. 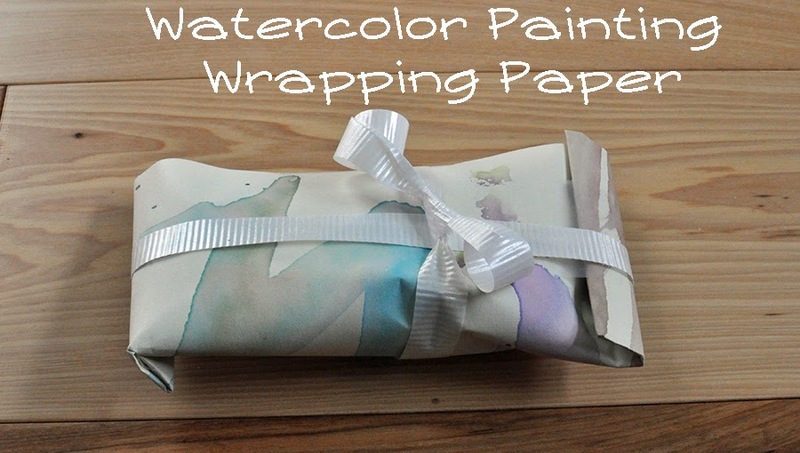 For this package, I used a watercolor painting of Greta’s. She makes such lovely abstract paintings with minimal lines and colors. 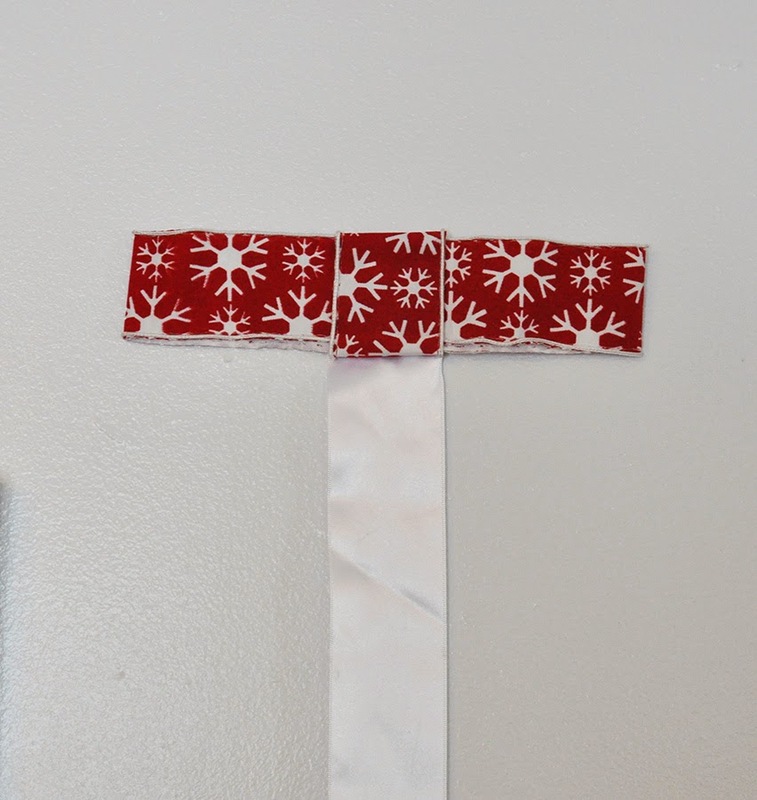 This wrapping method works better with thinner paper, so you can bend, fold, tape it together. 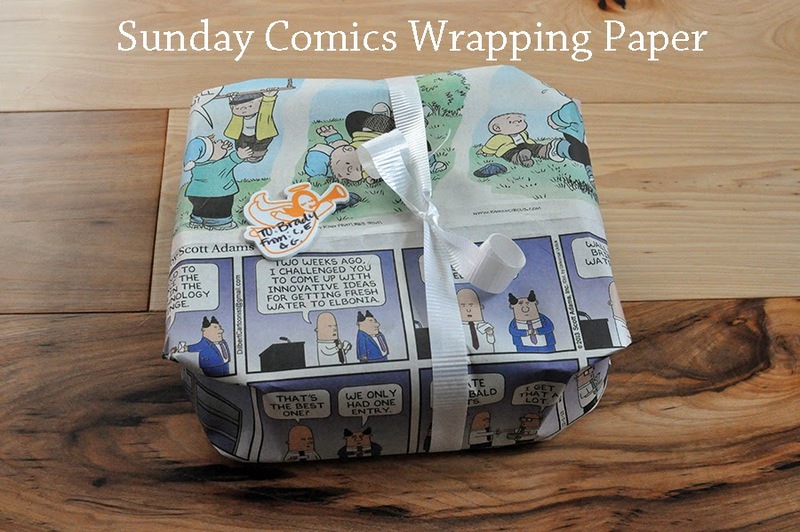 Lastly, my favorite alternative to wrapping gifts – the simple Sunday comics page. 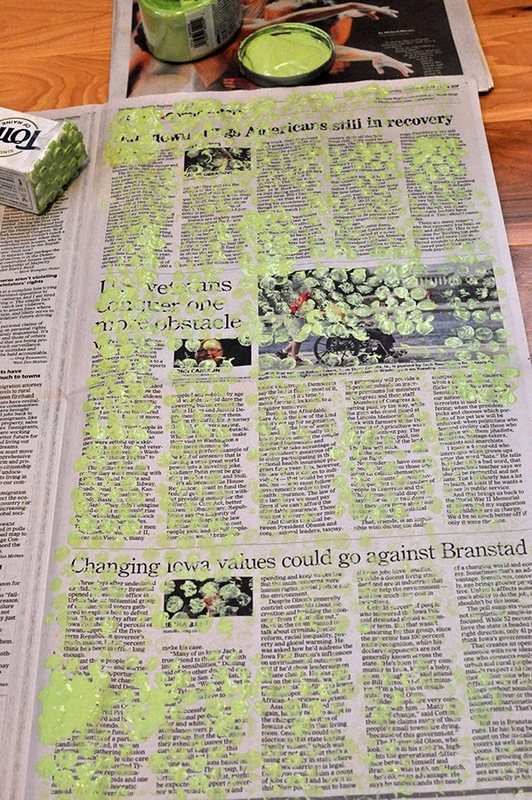 If you don’t subscribe to the newspaper, look for other every papers – catalogs, mailings, lined paper, etc. 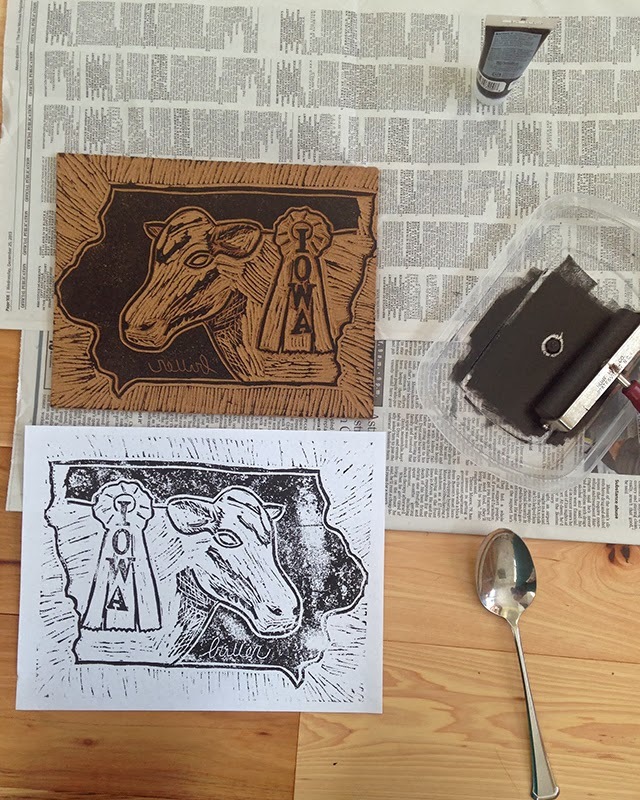 I have been busy making block prints this month – it all started with making return address labels via a block print. This one came about due to a shirt I love to wear with the state outline and home on the inside – I got it back in Greensboro from a fun shop downtown. Here is the link to the Etsy profile for these shirts. 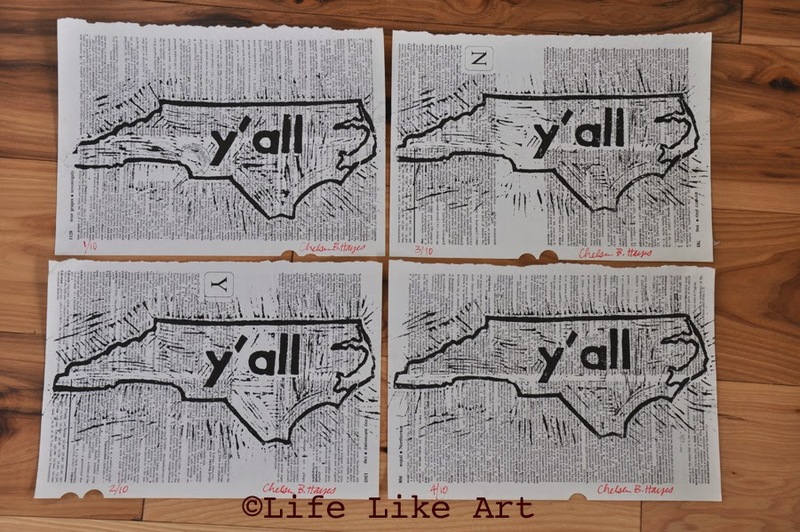 Each print is done on a page from a dictionary. Most of the pages have some sort of significance to the state of North Carolina – basketball, Tar Heel, sweet gum, etc.